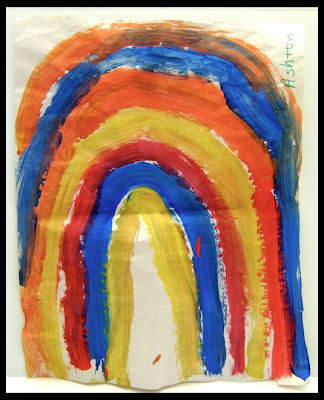 Ashton came home from Pre-school today with the hugest brightest Rainbow that she had painted. I thought it was lovely and deserved a place of honor in my day so this is my picture for today. I managed to do some serious paper sorting this afternoon. 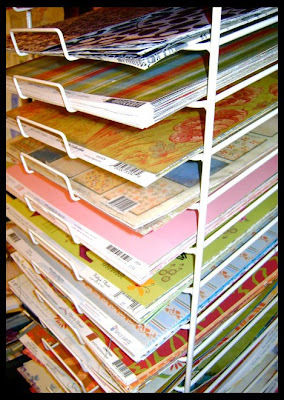 I have a lot of paper but it was not organized so at least now I can find that extra special color or design I knew I had but could not locate. Next on my to do list: Embellies! I LOVE the apple card Kazan....it's so stinkin' cute!! Little Miss Sweetie Pie's art work is WONDERFUL!!!! TFS!! HUGS!! Totally adorable card Kazan! The plaid is just perfect! What a beautiful rainbow! You've got a creative one...before you know it she'll be in your stash! lol! 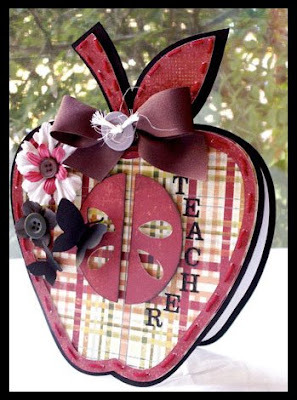 Love the appreciation card for the teacher, apples are so appropriate! Your little ones art work deserves pride of place! That apple is absolutely fabulous! As a teacher, I give it an A+!!! Love that you photographed the rainbow. I love that apple card! Any teacher would be thrilled to get that as a thank you. The teacher card is beautiful and I am envious of your paper storage! Your daughters are also very beautiful.